Rajasthan Budget 2015-16 Objective Questions: Rajasthan General Budget 2015-16 Objective Questions for RPSC, RAS, Rajasthan Police, Patwari, REET and other state government examination. Here we are providing 10 Questions based on Rajasthan Budget 2015 presented on 9th March2015 by Chief Minister Vasundhara Raje. Hope this will help all candidates in various examinations. Candidate willing to read full Budget in Hindi and English can also download Rajasthan Budget 2015-16 full in Hindi, English for in depth analysis and study for competitive examinations. However if you are having Android Mobile Phone you can read it with Question in the form of test paper at Android app which has 10000+ Questions and Short Notes. 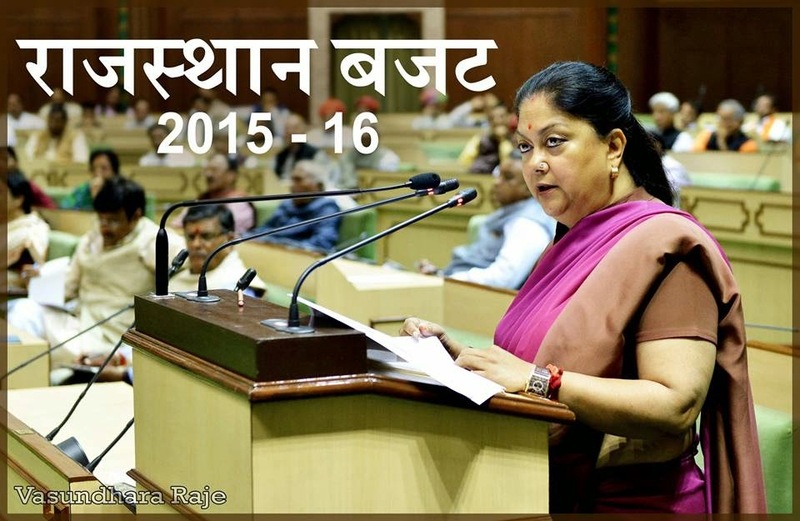 Q.1 As per Rajasthan Budget 2015-16 Estimated Fiscal Deficit for 2015-16 is ---------- of GSDP ? Q.2 As per Rajasthan Budget 2015-16 Estimated total revenue receipts for 2015-16 is ? Q.3 Rajasthan Budget 2015-16 propose MoU for 14,000 MV power generation by ? Q.4 Rajasthan Budget 2015-16 propose New Biological park worth Rs. 25 Crore in ? Q.6 Rajasthan Budget 2015-16 propose New Agriculture College in ? Q.7 As per Rajasthan Budget 2015-16 Estimated own tax revenue for the year 2015-16 is ? Q.8 As per Rajasthan Budget 2015-16 Estimated interest payment in 2015-16 is Rs. 11962.02 crore which is -------- of total revenue receipts ? Q.9 Rajasthan Budget 2015-16 propose Indoor Stadium in ? Q.10 Rajasthan Budget 2015-16 propose 50% rebate in AC and Volvo buses of RSRTC to ?